Minor Canon Youth Chaplain at St Albans Cathedral. Dog owner, historian, technology geek, pilgrim. One of my Lenten disciplines this year is to give up TV. Or more accurately, to give up watching endless box sets, which means Netflix! I spend far too much time in front of moving pictures. It’s always been a weakness for me which is why it’s taken me 10 years to buy a TV for my living room. I have a slightly addictive personality, so when I start something, I usually have to finish it, and will find imaginative ways to reach the end. A familiar position is sat with iPad or laptop on knee with a program on in the background. I choose to watch programs rather then go outside and be sociable. And other favourite hobbies fall by the wayside. So sorry Netflix, you have to go. Dvds, you’ll stay on the shelf. And TV, you can be unplugged (until the Youth Group come round, the only exception). So in this first week, a book has been read, a hood and gloves have been crocheted, and a new set of paints bought. It’s amazing what you can get done when your attention is not divided! 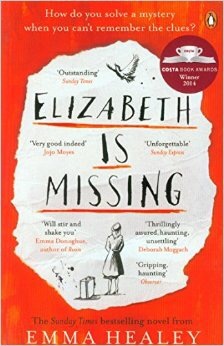 The first book I’ve finished this Lent is ‘Elizabeth is Missing’ by Emma Healey. It’s been sitting on the coffee table for a few weeks. A story of Maud, in her 80’s who is struggling with her memory. Extremely well written and a totally compelling story. Elizabeth is missing, but it turns out she is not the only one. She slips between the modern day ‘old’ Maud, and a much younger Maud who is looking for her missing sister. Maud even in her forgetful state is astute and articulate. She knows that she forgets things and can’t remember events, and as the tale unfolds, her distress and anguish increases. This is a book I would highly recommend. It’s poignant, funny, sad, frustrating and intriguing and you’ll be taken through an emotional roller coaster as you travel with Maud’s in her search for answers.